EVER wondered what the kit would look like if all six football teams in West Yorkshire combined for a one-off match? Personalised clothing brand Banana Moon compared each of the major clubs in the 10 biggest footballing hotbeds in the UK to discover the most popular colour ways for each region. The research was then used to design the perfect strip for the area. 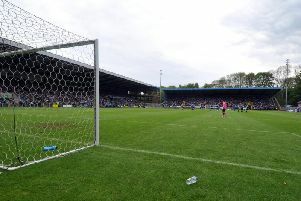 The company looked at Leeds United, Huddersfield Town, Bradford City, FC Halifax Town, Guiseley and Bradford Park Avenue. Bradford City fans will be disappointed to learn that the most popular kit combination for West Yorkshire proved to be a white body with blue sleeves. White was the most popular colour with 47% with blue getting 25%, while Bradford’s claret and amber do not feature after mustering a mere 8%. Five of the teams display some shade of white, most notably Leeds while Guiseley’s similar style catapulted it into spot spot. The blue sleeves were provided by the dominant features on the strips of Huddersfield Town and FC Halifax Town.